The Egyptian Air Force (EAF) has received its final three single seat Rafale EM fighters, which arrived from France at the end of November. This comes as Egypt seeks to order additional Rafales from Dassault. The last three Rafale EMs were received on 28 November, leaving the Dassault Aviation facilities at Bordeaux-Merignac and arriving at Gebel El Basur air base outside Cairo. They join 203 Tactical Fighter Wing ‘Storm’/34 Squadron ‘Wild Wolves’. The first single seat Rafale performed its maiden flight in July last year, with deliveries of the first three on 4 April this year, followed by two more on 26 July. Egypt ordered 16 Rafale DM twin seat and eight Rafale EM single seat fighters on 16 February 2015. So far, six Rafale DMs are in service. Egypt received its first three Rafale DM two seaters on 21 July 2015, allowing them to take part in the opening of the expanded Suez Canal in August. 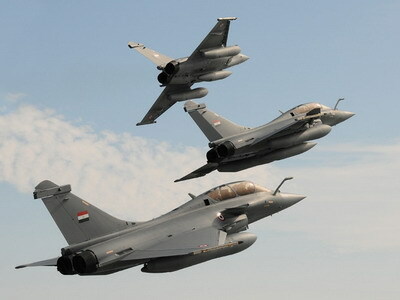 The first three Rafales were originally produced for the French Air Force but were diverted to Egypt instead, after some French equipment was removed. Egypt has used its Rafales in combat, and on 26/27 may this year officially carried out their first operational mission, protecting a strike package that was targeting Islamic State in Libya. They have also been used for training and exercises. Egyptian Rafales will be armed with Mica air-to-air missiles, Scalp cruise missiles and AASM Hammer guided missiles. The North African nation is now looking to acquire an additional 12 Rafales, and an Egyptian delegation visited France last month to move negotiations forward. The additional dozen are an option on the original contract. Egypt had been lobbying for several months to obtain the same financial package it obtained for the original order, but French Treasury opposed extending further unsecured credit to Egypt. This opposition was overcome in November, according to La Tribune, with a deal for the additional 12 aircraft possible before year-end. Is Airbus “blackmailing” SA on the A400M?